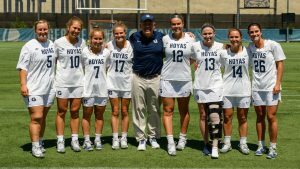 The Georgetown women’s lacrosse team (1-0, Big East) won its season opener at St. Joseph’s (0-1, A-10) 12-9 on Saturday afternoon. Senior attacker Taylor Gebhardt scored three goals and added four assists in the win, while senior attacker Morgan Ryan and senior midfielder Francesca Whitehurst each added a hat trick. Senior goalkeeper Haelle Chomo finished with eight saves. The Hawks started strong, scoring in 26 seconds and adding another within the first five minutes to take a 2-0 lead. 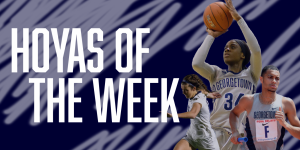 However, the Hoyas responded with two freshmen, attacker Ali Diamond and midfielder Katie Crager, scoring on their debuts within the opening ten minutes. St. Joe’s took the next mini run, building another two-goal lead before the Hoyas came back and tied it up again, this time with goals from their veterans Whitehurst and Gebhardt to tie it at 4-4. St. Joseph’s took the lead once more with 4:16 to play in the first half, but Ryan scored twice within a minute to give the Hoyas a deserved 6-5 halftime lead. 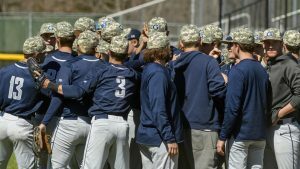 While St. Joe’s out-hustled Georgetown to ground balls 9-7 and Georgetown lost the turnover battle 10-7, the Hoyas were the team on the front foot. 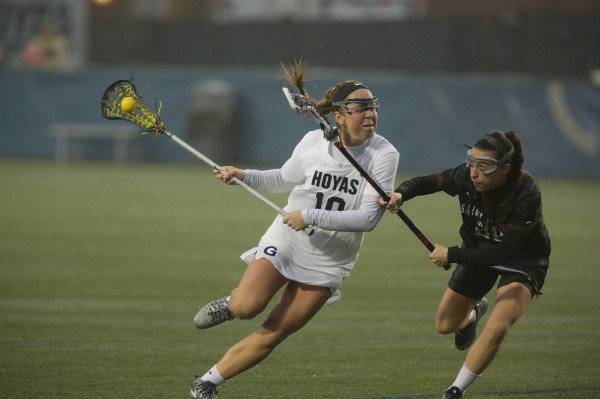 Georgetown won eight draws to St. Joe’s four, and outshot the Hawks 17-11. The Hoyas were also clinical with their free position shots, scoring on three of their five opportunities. St. Joe’s tied the game up to start the second half, but the Hoyas went on a 5-0 run to effectively seal the contest with two goals from Whitehurst, two goals from Gebhardt, and one goal from junior midfielder Natalia Lynch. St. Joe’s made it an 11-7 game with 4:45 to go, but Ryan dashed any hopes of a comeback with a goal 44 seconds later. The Hawks added two more in the final two minutes, but it wasn’t enough to deny the Hoyas their first win of the season. The Hoyas play No. 14 Towson (0-1, CAA) in their home opener on Saturday, February 16 at Cooper Field. The game is slated to begin at 3:00 p.m. ET. For live coverage of that game, as well as coverage of all of Georgetown sports, follow @GUVoiceSports on Twitter.